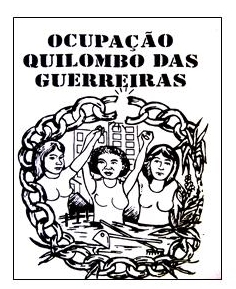 MTST poster for the Quilombo das Guerreiras Occupation. The Homeless Workers Movement (Portuguese: Movimento dos Trabalhadores Sem Teto. MTST) is a shack-dwellers' movement in Brazil. It originated from the Movimento dos Trabalhadores Rurais Sem Terra (English: Landless Rural Workers' Movement) in 1997. It is the biggest organisation of its kind in the country. Through a combination of direct confrontation and negotiation with the government, it struggles to reduce Brazil's deficit of roughly 8,000,000 housing units by staging squatters' occupations in the abandoned government buildings that litter Brazilian cities, resisting the often violent attempts by local governments to evict them and negotiating for their conversion into low-income housing. According to the MTST, there are over 5,000,000 housing units available in abandoned buildings in Brazil. The MTST originally emerged as a faction within the MST. MTST, however, focuses on urban instead of rural reform. Although fully autonomous, the organisation has a strategic alliance with the MST and also works closely with other Brazilian urban social movements such as the União Nacional de Moradia Popular (English: National Low-income Housing Union) and the Centro dos Movimentos Populares (English: Center of Popular Social Movements). The movement is politically heterogeneous. On one side, there are branches which resemble a Leninist political party in terms of structure and hierarchy, and on the other side, branches which are clearly committed to goals such as self-management. There is even a branch (in the state of São Paulo) which works almost as a faction of a political party. An occupation by MTST in Carapicuíba, São Paulo. The homeless movement is the most important social movement in Brazilian cities, since the favela movement became weaker and weaker since the 1980s (its role was decisive in the 1960s and 1970s resistance against evictions), due to factors such as political clientelism, and the influence of drug traffickers. The homeless also try to co-operate with other emerging social movements, such as "insurgent" hip-hop groups and, in the case of MTST, with the MST, one of the most important landless organisations. MTST was created by the MST in order to ensure representation of land reform advocacy in the urban sphere. According to the João Pinto foundation and with the Ministry of Cities, there are six million Brazilian families that are living in undignified conditions which is a constitutional breach since the constitution of 1988 states that dignified social living conditions are a right. The MTST justifies its activities because of the 1988 constitution where property is defined as a social right. Brazilian cities are often segregated geographically between the wealthy area and the "periferia"which translates to periphery. For a long time segregated social classes in the and rising rent is forcing people who were in difficult economic circumstances to move to the outskirts of the town. Movimento de sem-teto reúne 40 mil famílias. Por Cleide Carvalho. O Globo, 18 de outubro de 2013. Espaço intra-urbano no Brasil. São Paulo: Studio Nobel, Fapesp, Lincoln Institute, 2009. "Entenda a luta do MTST | Sociologia Ciência & Vida". sociologia.uol.com.br (in Portuguese). Retrieved 2017-11-30. ^ "Entenda a luta do MTST | Sociologia Ciência & Vida". sociologia.uol.com.br (in Portuguese). Retrieved 2017-11-30. ^ Espaço intra-urbano no Brasil. São Paulo: Studio Nobel, Fapesp, Lincoln Institute, 2009. ^ Villaça, Flávio (April 2011). "São Paulo: segregação urbana e desigualdade". Estudos Avançados. 25 (71): 37–58. doi:10.1590/S0103-40142011000100004. ISSN 0103-4014.